On October 30, 2009 3D film maker Greg Passmore was featured on the ABC News program Nightline to discuss his current production ‘The Extreme Nature of Bats’. Here is a link to the story. PassmoreLab is now actively distributing The Extreme Nature of Bats for Spring 2010 to Science Centers, Museums, Theaters and Attractions. 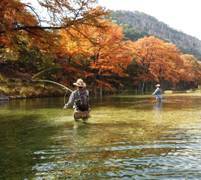 Nov.14th our area River fishing Guide Aaron Riggins & myself took Outdoor Writer David Sikes fly-fishing on the Frio. Read the Column, then click above the photo on Frio River Fishing & the pic will enlarge & have subtitles for the 39 beautiful photos that David Sikes took. Shows the beautiful Fall Color of the Cypress Trees along the river. Click here to read the article. 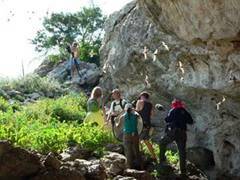 Frio Bat Flight Tours, managed by Hill Country Adventures, hosts the second-largest bat population in the world, as well as hundreds of tourists March through September. Includes interview with LeAnn Sharp VP of the Texas Bluebird Society. LeAnn tells about her experience with Eastern Bluebirds, and how she inherited her affection for bluebirds from her parents. Tells about All of our Tours & our Rio Frio Lodging. Photo on pg.43 of LeAnn Sharp Telling Stories to guests around a campfire. Story tells about our lodging and many Adventurous Tours. 'Ms Adventure' - starring Rachel Renstra (a former stand up comic) Our main guide Bain Walker who has been leading the Bat Tours since 1998 was on the show with her. Bain took her rappelling into the cave, then they suited up, went down inside to see the bats on the ceiling wall, then she interviewed & asked him questions while the bats were flying out. Several of the tourists watching the filming & bat flight got autographs & photos with 'Ms Adventure'. Look for the Series 'Ms Adventure' - Fridays at 8pm Central Time. Bain & the Frio Cave Bats were on the segment called "Cliques" (as in Herds, Flocks, Colonies) Bain did a great job & the filming was awesome!